The chloroplast is the site of photosynthesis in eukaryotic cells, and is the site of the Calvin cycle just as the mitochondrion is the site of oxidative phosphorylation. The thylakoid membrane, with its embedded photosystems, is the structural unit of photosynthesis. Both photosynthetic prokaryotes and eukaryotes possess membranes with embedded photosynthetic pigments. 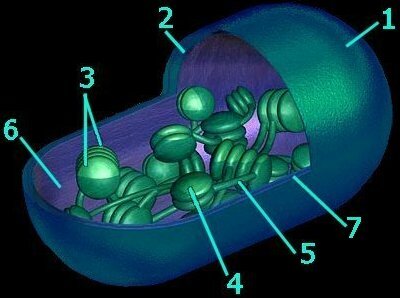 Only eukaryotes, which have a nuclear membrane and membrane-bound organelles, possess chloroplasts with an encapsulating membrane. The chloroplast has three compartments, while the mitochondrion has only two. 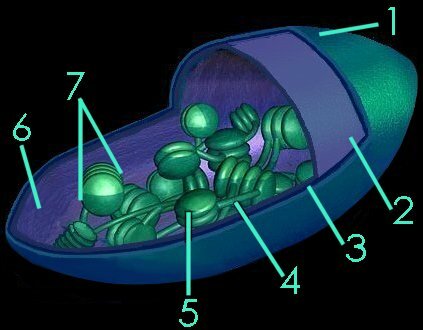 Compartments within a chloroplast are the intermembranous space , the stroma , and the thylakoid lumen (8) within stromal and granal thylokoids [4,5]. The typical higher plant chloroplast is lenticular and approximately 5 microns at its largest dimension. Plant cells contain from 1 to 100 chloroplasts, depending on the type of cell. 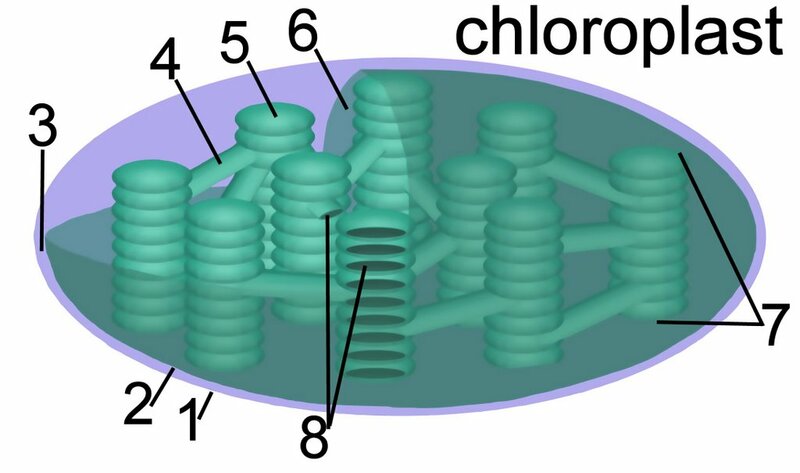 The mature chloroplast is typically bounded by outer (1) and inner (2) membranes that possess significantly different chemical constituents. 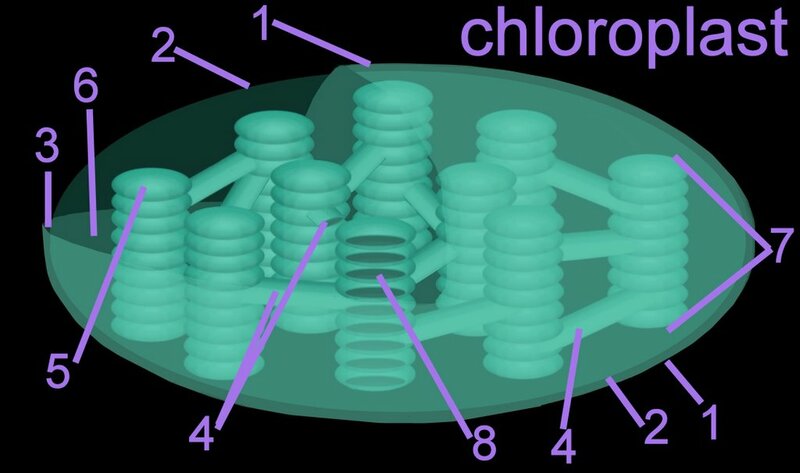 In addition to enzymes that function in photosynthesis, chloroplasts also contain a circular DNA molecule and the protein-synthetic machinery characteristic of prokaryotes. 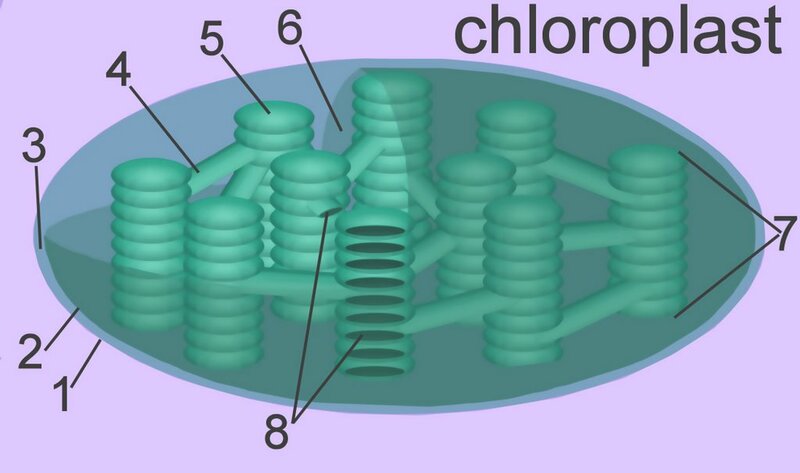 Each chloroplast contains about 40 to 80 grana (7), and each grana comprises about 5 to 30 thylakoids. The thylakoids are membranous disks about .25 to .8 microns in diameter, which contain protein complexes, pigments, and other accessory components. The phospholipid bilayer of the thylakoid is folded repeatedly into stacks of grana. (details) These stacks are connect by channels to form a single functional compartment. The smooth outer membrane (1) is freely permeable to molecules, and resembles the chemical constitution of the eukaryotic plasma membrane. 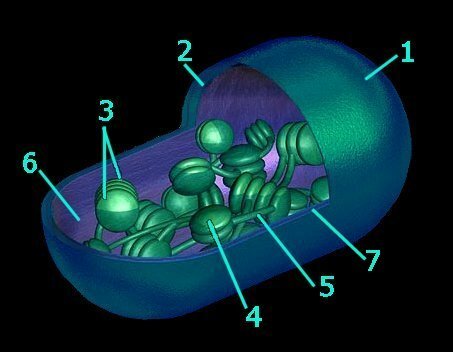 The smooth inner membrane (2) contains many integral transporter proteins that regulate the passage of small molecules like sugars, and proteins (synthesized in the cytoplasm of the cell, but utilized within the chloroplast). The inner membrane chemically resembles prokaryotic cell membranes. The thylakoid is the site of oxygenic photosynthesis in eukaryotic plants and algae, and in prokaryotic Cyanobacteria. Cyanobacteria possess thylakoid membranes, but as prokaryotes they do not contain chloroplasts. Chlorophyll, accessory pigments, and other integral membrane proteins transduce light energy to provide excited electrons (excitons) to electron transport chains, powering the formation of NADPH and ATP during photophosphorylation. The folded thylakoid membranes perform the light reactions of photosynthesis utilizing Photosystems I and II, both of which include chlorophyll and carotenoid molecules (bsim - chlorophyll, spfim - chlorophyll, bsim - carotenoid). 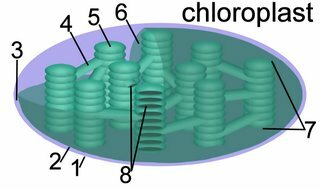 The reaction center chlorophyll molecule within the antenna of photosystem I responds most strongly to 700 nm light, and is therefore termed P700. The reaction center within the antenna of photosystem II responds most to 680 nm light, and is accordingly called P680. Photosystem I evolved very early, and it is found in nonoxygenic phototrophs; photosystem II evolved later. Because the PSII photosystem is most sensitive to shorter wavelength 680 nm light, it absorbs slightly more energy than the P700-PSI system. The electron transport system of each photosystem is embedded within the thylakoid membrane and functions in the production of ATP. 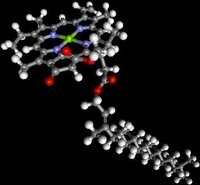 The system comprises membrane-bound electron carriers that pass electrons from one molecule to the next. The purple bacteria utilize only one photosystem (PSI), while oxygenic phototrophs utilize two photosystems (PSI and PSII). The photosynthetic machinery of nonoxygenic photosynthetic purple bacteria is often located in intracytoplasmic membranes. It is not yet known whether or not these membranes are similar to the thylakoid membrane of oxygenic phototrophs, or whether these intracytoplasmic membranes of nonoxygenic phototrophs are merely an extension of the plasma membrane. The current consensus is that chloroplasts originated from Cyanobacteria that have become endosymbionts. This is an origin analogous to the endosymbiotic origin of mitochondria, which are believed derived from "purple bacteria", alpha-proteobacteria most closely related to Rickettsiales.